What a difference the sunshine makes. For the first time I can remember in a very long time, we got to enjoy fine weather on a bank holiday weekend. We spent as much time as we could outdoors and it felt like we were on a mini holiday. The whole of nature seemed to have jumped into action with the trees, hedgerows and fields bursting into spring flower. 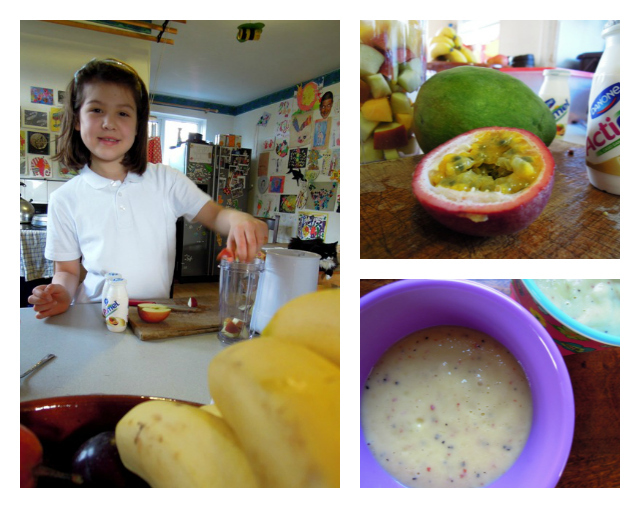 … while I got the children making slightly healthier smoothies with mango, passion fruit and apple, along with some special edition mango and passion fruit flavoured Actimel we were kindly sent to try out. A deliciously fruity start to the day. On Saturday my parents came to stay. They arrived just in time for lunch and we tucked into spring lamb that had been slow roasting in the Aga all morning, served with homegrown purple sprouting broccoli and an Ottonlenghi-inspired aubergine and courgette risotto (a recipe I’m going to be making again and again), all washed down with a light, sunshiny rosé. To walk off lunch we took a leisurely stroll around the tranquil Bishop’s Palace Gardens in nearby Wells. I’m working at the moment in Wells so it makes a lovely change to visit the city as a tourist. The children loved dressing up as bishops (perhaps by the time they’re grown up the Church of England will actually allow women bishops? ), climbing trees, playing Pooh Sticks with Grandad in the palace moat and trying to wake the sleeping willow dragon. I was rather taken with the community gardens – what a wonderful place to have an allotment. On Sunday we took Nana and Grandad for a walk across the fields behind our house, carefully skirting around the protective cows and their calves, to go and feed the two local nanny goats. One of the goats was so heavily pregnant she could barely walk; it made me wince to look at her. We also visited the field of sheep and their dainty lambs, whereupon Mia decided we should buy ourselves a pet sheep and lamb and keep them in the garden so that Daddy doesn’t have to mow the lawn anymore. 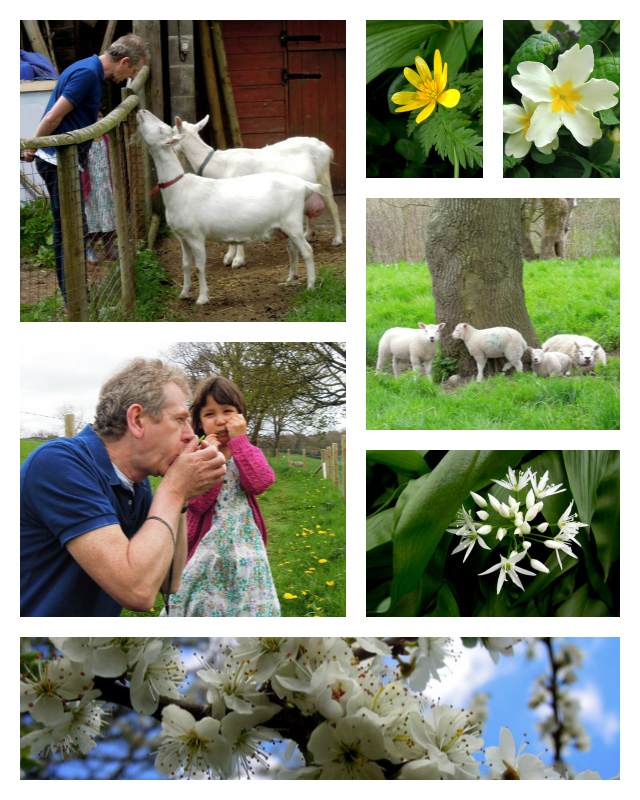 Grandad tried to teach Mia to make duck noises by blowing on grass (unsuccessfully) and we foraged for wild garlic in the hedgerows (successfully). So that was how we spent our bank holiday. What did you get up to this weekend? Disclosure: I was sent samples of the new limited edition Mango & Passionfruit Actimel to try out, along with fresh fruit and a smoothie maker. I also received samples of Dr Oetker’s Wafer Butterflies to see what I thought. No money exchanged hands and the views expressed here, as they are throughout my blog, are completely my own. 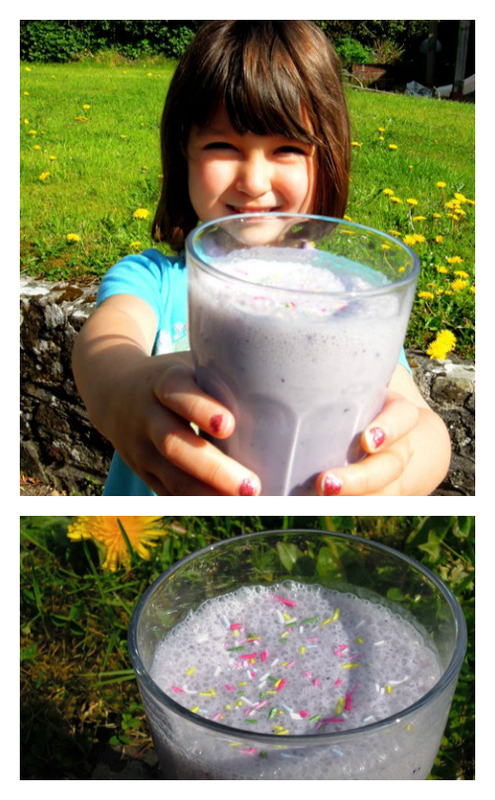 I’m linking this post up with this week’s Kids in the Kitchen hosted by Look What Mom Found – it’s a great way to share ideas and recipes for involving this little ones in the kitchen. Looks like a lovely weekend. Your lunch with lamb, PSB and the Ottolenghi recipe sounds so seasonal and delicious. Thanks Andrea. Yes it was a gorgeous weekend – what’s happened to the weather now though? Was that our summer? I hope not! 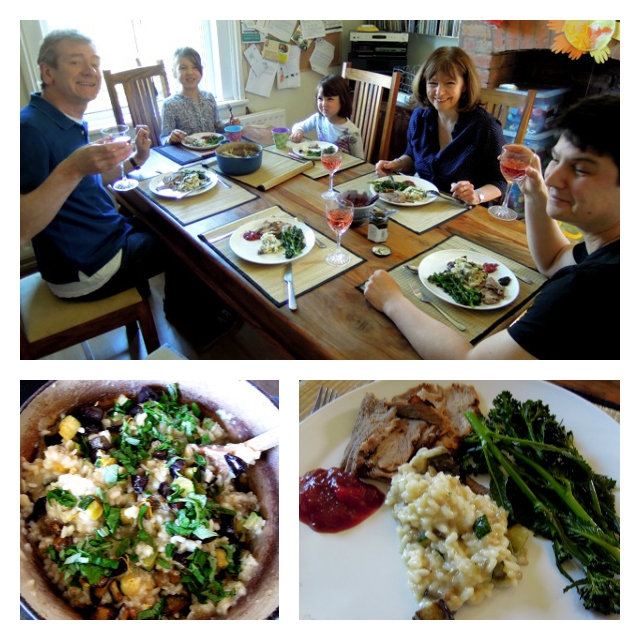 The risotto was delicious. Might have to include it on the blog sometime soon. You had a busy weekend then! Sounds good though – lots of time outdoors, and some great food… perfect. Oh yes, my idea of the perfect weekend! What a lovely weekend! So glad finally Britain experienced a sunny bank holiday! We had a gorgeous weekend here too, but yesterday and today are bank holidays in France and it’s rain, rain and yet more rain 😦 And you really must post the risotto recipe! Thanks Melinda – I’d love to share on your linky – will be straight over! What a great weekend!!! I love smoothies for breakfast – usually just a simple strawberry-banana, though. Thanks Sara – it was a lovely weekend. Feels like a long time ago now though. The weather’s turned all gloomy and wet here in the UK. Boo!